Sewer flooding is unpleasant and distressing and water companies spend millions every year to prevent it from happening. There are also steps you can take to reduce the risk of a sewer flood in your house or garden. 3,659 Properties that were internally flooded by sewage. Does not include flooding from all the sewers that companies are now responsible for, or where the same property has flooded more than once in the same year. Even one house flooded with sewage is one too many and water companies are working to reduce sewer flooding. Companies have invested many millions to reduce the number of times this happens and customers are 8 times less likely to suffer sewer flooding than they were in the early 1990s. How can companies be compared? There are different ways to compare how companies are doing on sewer flooding. Companies have targets for reducing the number of properties that are flooded with sewage – are they meeting, beating or failing them? The targets for companies aren’t all the same – so to compare companies against each other you need to look at a standard measure. The standard measure is the number of properties flooded per 10,000 properties connected to sewers – the lower the better. This measure includes the impact of all storms, so that customers can see how their company performs on sewer flooding whatever the weather. But it doesn’t include flooding from all the sewers that companies are now responsible for, or where the same property has flooded more than once in the same year. Despite the millions invested by water companies every year, there are still a number of things that can cause a sewer to flood – and these can have different impacts across the country and between years. An increasing cause of sewer flooding is because they get blocked after the wrong things are put down the toilet. Wet wipes and sanitary products are a major cause of blockages and should the thrown in the bin. Only the three ‘Ps’ should be put down the toilet – pee, poo and paper. One of the impacts of climate change is heavier and more intense rainfall, which can overwhelm the sewer and drainage system. As the standard measure includes the impact of all storms, extreme weather can make figures vary from year to year. Today, we build separate sewers to take away water that has been used in the house. But in much of London and other cities, the sewer system is combined with the drainage system, meaning that water used in kitchens, bathrooms and toilets mixes with rainfall, and there’s more water to deal with. Have companies met their targets for internal sewer flooding? The graph shows whether companies have met their targets for preventing properties from being flooded with sewage in the latest year. If the actual figure is less than the target, the company has beaten the target. Why aren’t there targets on the graph for some companies? Each company has agreed a target with its customers and Ofwat, the regulator. Most companies have a target based on a measure of the number of properties that are flooded. Some companies have agreed different targets or don’t have a target for every year: as these aren’t comparable with each other, they aren’t shown on this graph. For more information you can go to the company’s website using the link below. This graph compares companies against each other for the latest year. To compare companies of different sizes, the number of properties flooded with sewage per 10,000 connections to sewers is shown. Number of properties flooded with sewage (per 10,000 connections to sewers). Does not include flooding from all the sewers that companies are now responsible for, or where the same property has flooded more than once in the same year. This graph compares companies against each other for the last three years. To compare companies of different sizes, the number of properties flooded with sewage per 10,000 properties is shown. Has this information helped you understand how companies compare on sewer flooding? ​When sewage floods into gardens and on private land, it is unpleasant and distressing. Companies have invested many millions of pounds to reduce the likelihood of this happening. But even one garden flooded with sewage is one too man, and water companies are working to further reduce sewer flooding. This graph compares companies against each other for the latest year. To compare companies of different sizes, the number of areas of private land or gardens flooded with sewage per 10,000 connections to sewers is shown. Number of external areas flooded with sewage (per 10,000 connections to sewers​). Does not include flooding from all the sewers that companies are now responsible for, or where the same area has flooded more than once in the same year. This graph compares companies against each other for the last three years. To compare companies of different sizes, the number of areas of private land or gardens flooded with sewage per 10,000 connections to sewers is shown. When a sewer or drain blocks, it can cause flooding in people’s homes. Blockages can also lead to environmental pollution, damaging rivers and beaches. Wet wipes (including those labelled as “flushable”), disposable nappies and sanitary products are the main items that cause problems. Although it may be convenient to put sanitary products down the toilet, they can get snagged in the sewer, build up and cause sewer flooding. To avoid this happening, our advice is to bag and bin these products. By doing so you will help reduce the cost of unblocking public sewers and drains, and help keep your sewerage bill down. • pour your oils, fats and grease into a can or bottle, allow it to harden and then put it into your bin. • ask your sewerage company for a ‘fat trap’ – these are provided free of charge. • mixed with seeds and nuts, fats can be put into your garden as a bird feeder. Avoid putting food scrapings down the sink, regardless of what it says on the packaging. Instead, put it in the bin. Drains and sewers - which do you own? 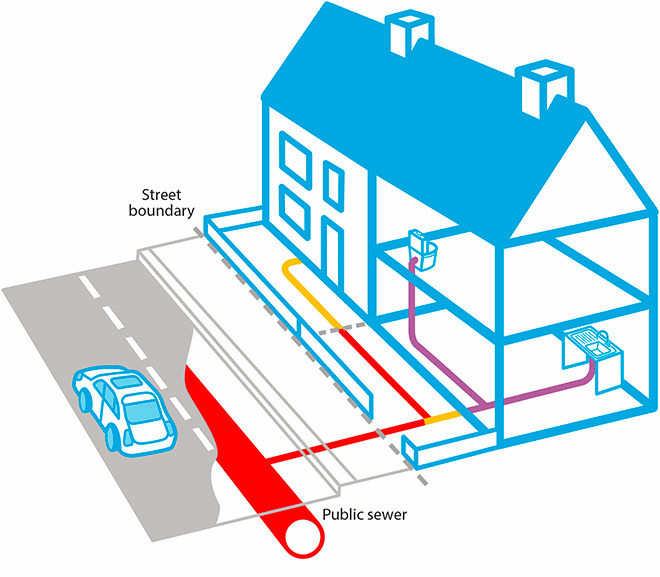 You are responsible for the drains (in purple) that takes sewage away from your property up to the boundary or to where it joins (in yellow) with pipework from another property. The pipes in red are owned by water companies. Do you have a question about sewer flooding?